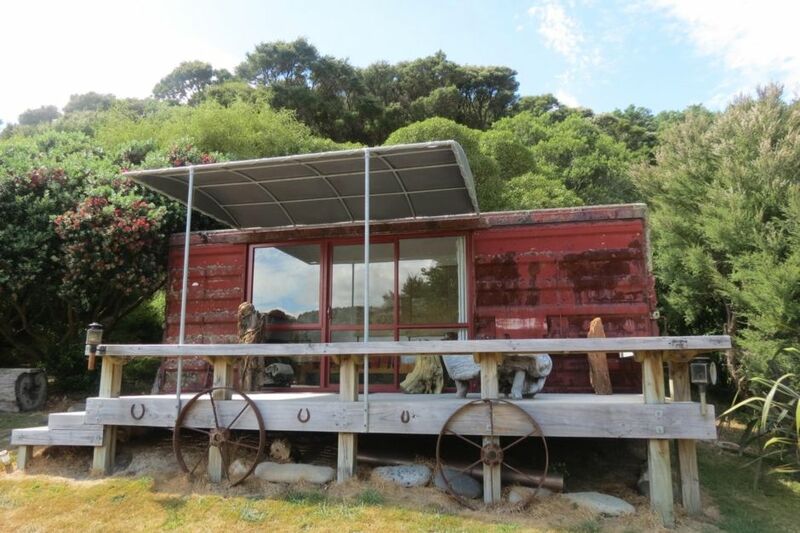 Te Rakau Bunkhouse is a converted railway carriage that contains 1 queen sized bed, 1 single bed and a set of bunks. The Cookhouse is a separate facility with gas cooking and everything you need to enjoy your stay. Our outdoor gas shower is both efficient and different. There's an outdoor bath to enjoy and relax in while looking at the stars. A covered deck area with elevated views allows guests to spend time watching the birds and other animals close by. Evenings around an outdoor fire can also be enjoyed. Close to the Palliser Bay coast and a unique wetland area, there are many walks available. Pets are welcome but we would request that they NOT sleep inside the Bunkhouse or Cookhouse and that guests let us know in advance if they are bringing pets. Self cook meals are available for cyclists only on request @$60pp. Many walks and cycle rides available closeby. My friend and I stayed at Te Rakau as an overnight on the Remutaka Cycle Trail. It was a perfect stay, and Denise and Dougal are wonderful hosts. The location is wonderful, with beautiful sunsets and sunrises. Highly recommend a stay here! Beds were very comfortable too. Lovely Tom the Norwich Terrier was an added bonus. Lovely place to come to get away from the city, beautiful surrounds and very comfortable facilities. Kind and generous hosts. Peaceful and fun. The perfect spot for a rustic, relaxing getaway. We loved rugging up in front of the brazier and the night sky was incredible so far from any light pollution. The bed was comfy and we will definitely be back. So glad you enjoyed your mini break. Hope you make it back someday. Soak in an outdoor tub underneath the stars! We had a lovely stay at Te Rakau! Exactly the break away from the city we needed. It is perfect for cyclists, small families and couples just wanting a bit of time out from technology. It has bear essentials - there is a port-a-loo toilet and we did all of our cooking on gas cookers. Exactly what we wanted - Close enough to camping but without having to pitch a tent!!! There is a fridge and a zip for hot water if needed which is the only real luxury that you need when you stay in an amazing spot. Thanks Dougal for the lovely stay.